Close to Borgholm, there is the Borgholm castle and Solliden Palacy, the summer villa of Swedish Royal Family. When we left from Borgholm, we were able to see Solliden from the sea - and the surrounding sea area was marked with the yellow special marks. We were trying to use binoculars to check if any members of Royal family would have been there but unfortunately, we could see none. Sailing from Borgholm to Bergkvara was pretty great! 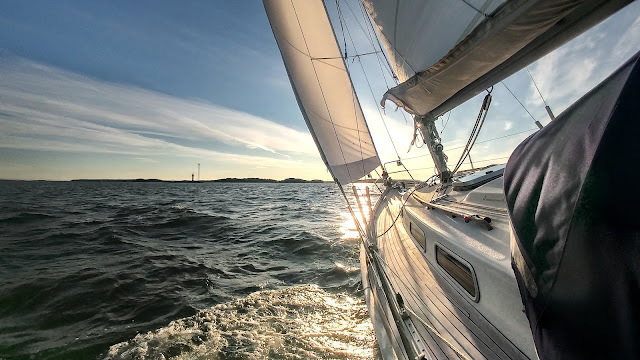 The sun was shining, it was more than 20°C and we sailed down wind and moved smoothly. Only for the one last hour after six ones of sailing we needed the motor to help since the wind started slowly abating. On the way we passed the town of Kalmar and Öland Bridge - the huge bridge from the Swedish mainland to the Öland island. The bridge is more than 6 km long - it is one of the longest ones in Europe and it was a sight in itself. When we arrived to Bergkvara, we knew there was a lot to do. We had to fill up the diesel tank and empty the septic tank, but we also had to find out how I could make it to Kalmar on Monday since I was about to leave for home. In other words, it was the last night of my first part of this summer's sailing trip so far since I needed to come home to work for a couple of weeks. Thus, the feelings were a bit down - our trip started very well and I would have wanted to continue instead of going home and working... 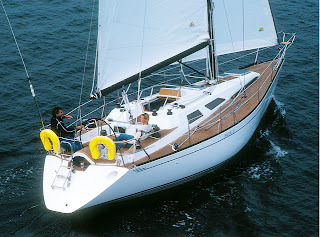 But I must remember, there are only a couple of weeks left and then we will be sailing in Norway - on condition that Antti is able to sail the boat that far first!